The much anticipated changes to the embedded benefits regime came a step closer last week with Ofgem’s announcement that it is minded to implement a proposed change to the CUSC that would limit the demand residual component of TNUoS payments to embedded generators to around £2 /kW, down from current levels of £45 /kW. A full review of the range of other payments available to embedded generators is set to follow later this month. Ofgem believes the level of the demand-residual payment, currently double the size of the 2016 Capacity Market auction clearing price, distorts the market, and with the payment set to increase to £72 /kW over the next four years, it believes that action is needed. £2 /kW is the estimated cost of building new capacity at the grid supply points (the boundaries where the high voltage network meets the lower voltage distribution networks), which is avoided when embedded generators deliver electricity directly to the lower voltage grids. Developers of embedded generation have reacted angrily, as these changes will materially impact the economics of embedded generation projects. They also feel the consultation process consultation has been dominated by coal generators with vested interests as the change was proposed by SSE as a member of the CUSC Panel. 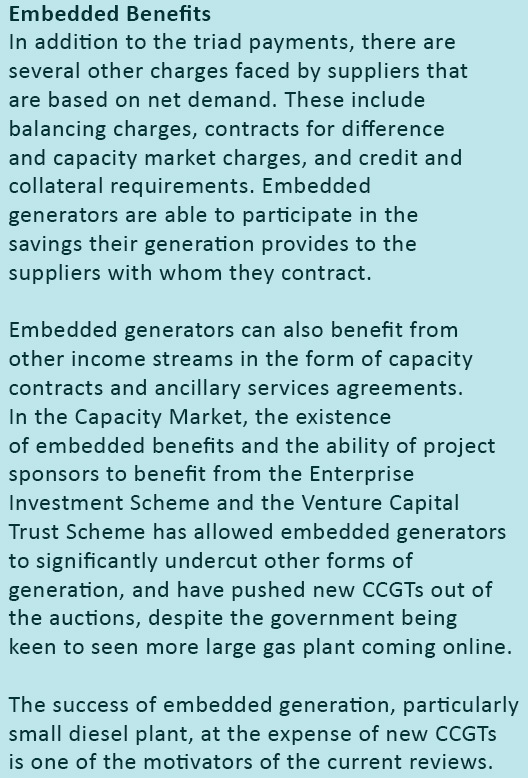 Embedded generators are able to access a number of revenue streams (see box), however Ofgem is specifically tackling the so-called “triad” component of transmission charging. Transmission operators are allowed to recover certain costs from consumers via mechanisms set out in the RIIO price control model, described in my previous post on transmission charging. These costs are charged to both generators and consumers (via suppliers) as users of the transmission system, and their allocation is determined by the Connection and Use of System Code (CUSC), however, EU rules cap the amount of charges generators can bear (at €2.50 /MW) in order to maintain cross-border consistency, so the bulk of the costs fall on consumers. It is these costs that are covered by the Ofgem proposal. Suppliers are charged the TNUoS residual cost (or “TDR”) based on the amount of power they draw from grid supply points on the three highest demand periods in the winter (the “triad periods”). Embedded generation acts as negative demand as the costs are currently allocated on a net basis. Suppliers also enter into arrangements with large consumers to reduce demand in those periods, either by load-shifting or by using on-site back-up generation (“triad-avoidance”). The suppliers then share these savings with the embedded generators and consumers participating in triad avoidance. The extent to which any supplier is able to reduce its draw on the transmission system during the triad periods serves to increase the amount other suppliers will need to pay – in other words costs are not saved, their allocation is simply changed. Embedded generators argue that as they connect to distribution networks, less investment in the high voltage grid is needed and this justifies the payments they receive, however Ofgem believes that this is not entirely the case since the transmission system is still used as a back-up for local areas with embedded generation. Ofgem also believes that embedded generation affects the stability of the wider transmission system imposing stabilisation costs on the system operator which must be recovered, although opponents argue that these effects are small. The issue is causing tensions between traditional, transmission-connected generators, and embedded generators, not least because and changes to the method by which the costs are defined in the CUSC is determined by the CUSC Panel and Ofgem – and the CUSC Panel comprises companies that are connected to the transmission system ie excluding embedded generators. Panel members are required to act independently and not as representatives of their companies, however embedded generators claim that this would not effectively prevent bias in decision-making. Ofgem will now consult on the proposals before reaching a final decision in May. Unusually, Ofgem does not propose to grandfather existing projects, meaning that if the changes go ahead, they will apply retrospectively. This means that generators under 100 MW will see their triad benefit reduced by around a third each year from 2018. According to the Financial Times, more than 2 GW of generating capacity could be thrown into doubt if these changes go ahead. Tim Emrich, CEO of UK Power Reserve, one of the biggest developers of small gas generators, said 500 MW of capacity planned by his company was “at risk”. Research by KPMG commissioned by the company estimated that 2,100 MW of capacity could be withdrawn, which could have significant security of supply implications. “Perceptions of regulatory risk in the GB market are already significant, and this latest development further jar investors nerves. Ofgem is also intending to launch a further consultation of the wider suite of embedded benefits later this month, with the potential for a significant code review. Many in the industry feel that the proposed changes to the triad payments should have been part of the wider review, but Ofgem believes that the issue us too large to leave for the time – potentially 2 years – that an SCR would take. In addition, National Grid is conducting its own review of transmission charging, and the government is expected to introduce environmental legislation to curb the use of diesel-powered embedded generation. In addition, BEIS announced last October that it plans to change the rules so that the capacity market supplier charge is collected based on gross, rather than net demand, which will remove a further, albeit smaller, embedded benefit entirely. Taken together, these changes will materially alter the economic landscape for embedded generators, and it may well be that the energy transition will enter a new phase where greater emphasis is placed on transmission and flexibility and not just capacity.